DDOT crews mill a section of Loughboro Road NW during the agency’s effort to repave almost a mile of the roadway. In April 2018, Mayor Muriel Bowser challenged DDOT to eliminate all roads in poor condition in Washington, DC, by 2024. We’re making progress. DDOT has paved more than 50 miles of roadway since the launch of Mayor Muriel Bowser’s PaveDC initiative. 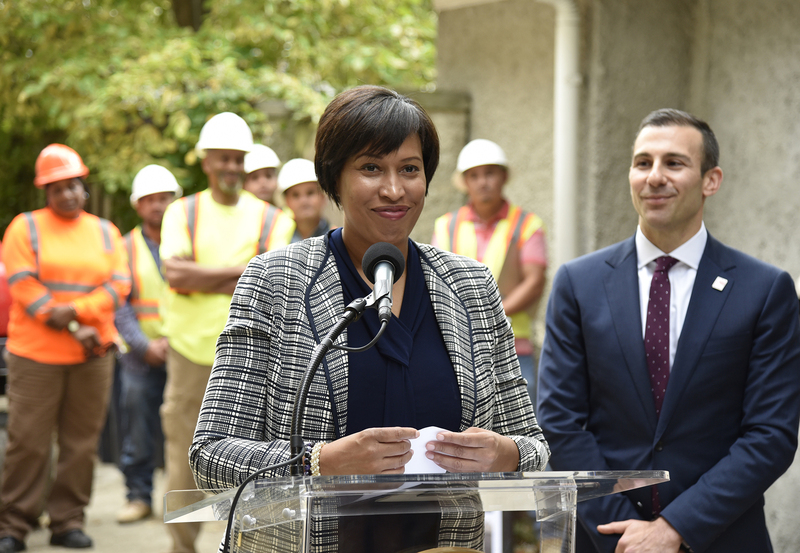 This concerted push to restore the District’s streets has been made possible by the Mayor’s sizeable commitment to long-term investments in the District’s infrastructure. 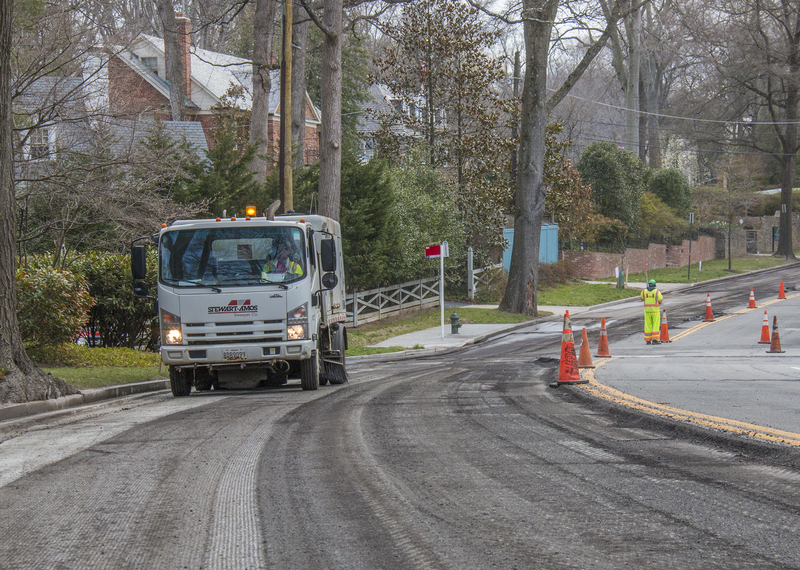 Over the past two fiscal years the District has averaged more than $25 million per year in spending on local street renovations. Moreover, the District has seen an influx of spending on local streets since Mayor Bowser took office. In FY 2016, the District spent more than three times more on local streets than it averaged in the four fiscal years before the Mayor took office (FY 2011 – FY 2014). Over the past two fiscal years (FY 2017 and FY 2018) the city expended more than four times as much for local street repairs than it averaged from FY 2011 to FY 2014. 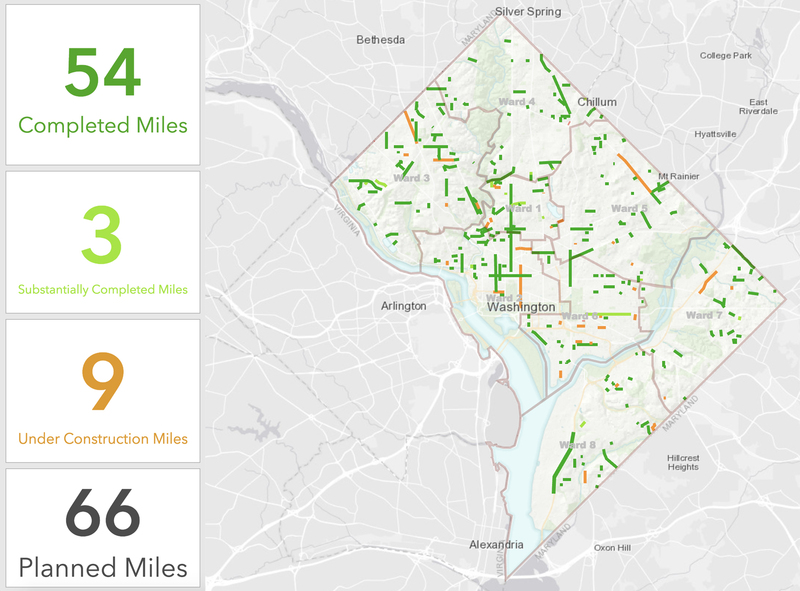 As part of PaveDC, DDOT debuted an interactive tool that District residents can use to track the agency’s progress in restoring the District’s infrastructure. In addition to showing roadway projects that have been completed, are in progress or are in DDOT’s queue for repair, the PaveDC interactive map helps residents monitor the agency’s progress on its alley paving and roadway marking efforts. A snippet of the District’s progress in repaving the city’s roadways from the PaveDC interactive map (ddot.dc.gov/pavedc). A DDOT crew plants an American hornbeam tree on the 1700 block of 30th Street SE. On a crisp October day a DDOT team was planting an American hornbeam tree (Carpinus caroliniana) on the 1700 block of 30th Street SE. The tree, when fully grown, could reach almost 50 feet high – just high enough to peer out from its new home in the District’s Randle Highlands neighborhood onto a city that is greener than ever, and expanding its tree canopy at a feverish clip. Starting in FY 2017, DDOT has planted more than 8,000 trees annually, which is more than twice as many trees as it averaged from FY 10-13. The agency is accomplishing this at a rapid pace: it is planting around 100 trees per day this tree planting season, which started on October 1. 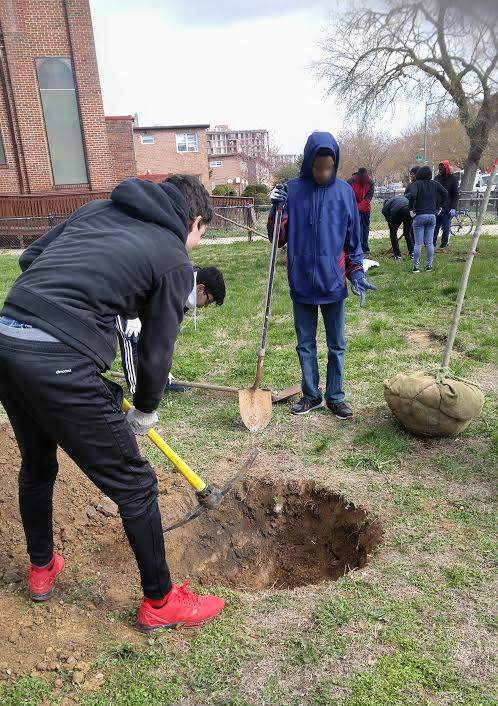 Aside from its breakneck efforts in adding street trees around the District, over the past few years DDOT has helped to expand the city’s tree canopy by taking on the responsibility of planting new trees in the District-owned land, such as parks and schools. Starting in late 2016, DDOT was charged with planting and maintaining trees in District-controlled parks and schools. During the 2017 tree planting season, DDOT planted 370 trees at such locations. Residents of Greenleaf Gardens in Ward 7 help plant trees provided by the Earth Conservation Corps (ECC), through DDOT. Photo courtesy of ECC. 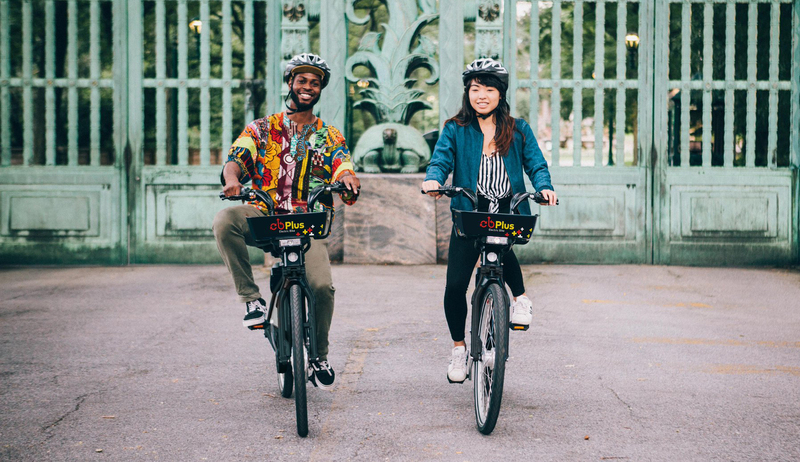 Additionally, DDOT has partnered with nonprofit organizations, such as the Earth Conservation Corps (ECC), by providing these organizations with grants to expand the green space in public housing developments. In 2017, for example, ECC planted more than 200 trees in public housing developments in Wards 7 and 8. 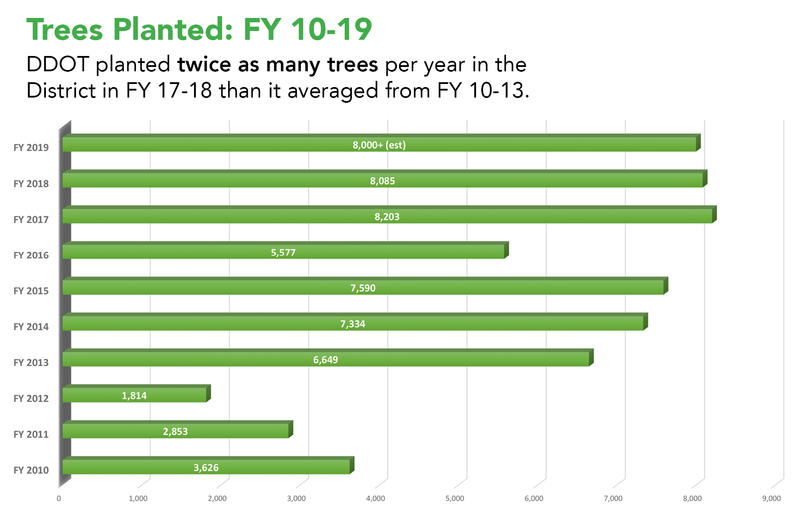 DDOT’s new benchmark of planting 8,000 trees per year might be hard to meet in the future for one simple reason: the agency is running out of existing open tree box spaces to plant trees in. 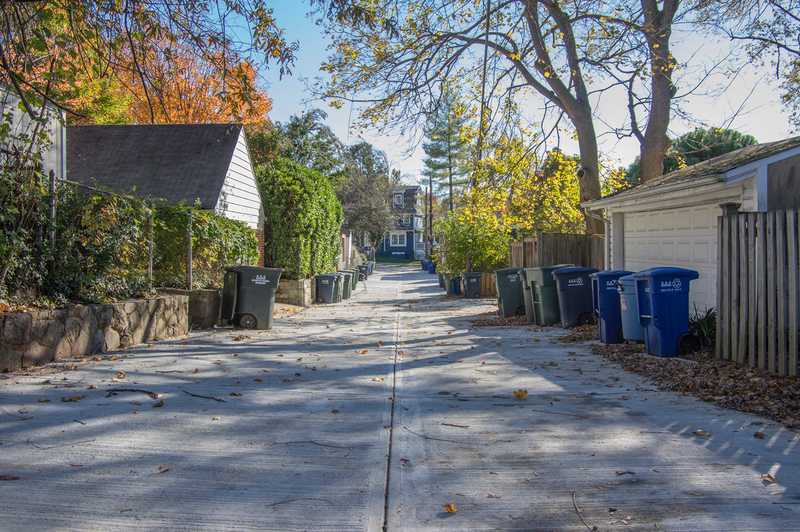 As of October 19, DDOT has ensured that trees are planted in more than 93 percent of tree box spaces in the District. Current spaces to plant trees in the public right-of-way are becoming scarcer – in some Wards there are only a couple hundred open spaces to plant trees in. 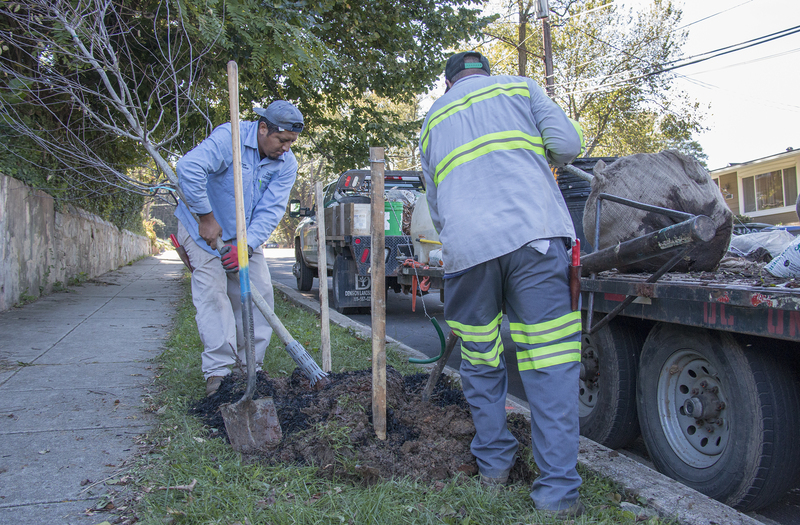 Taking on the stewardship of trees beyond the scope of what DDOT has traditionally overseen, namely trees in the public right-of-way, is more than a set of new obligations that the agency is happy to take on. 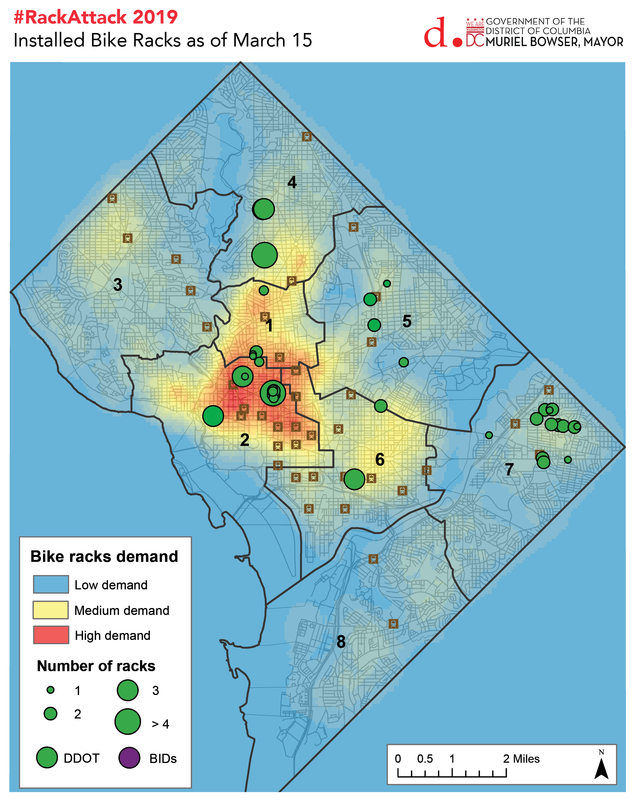 It might open up much-needed real estate on which to plant new trees, and grow out a healthier, greener DC. A temporary pathway for pedestrians beside a work site on I (Eye) Street SE. 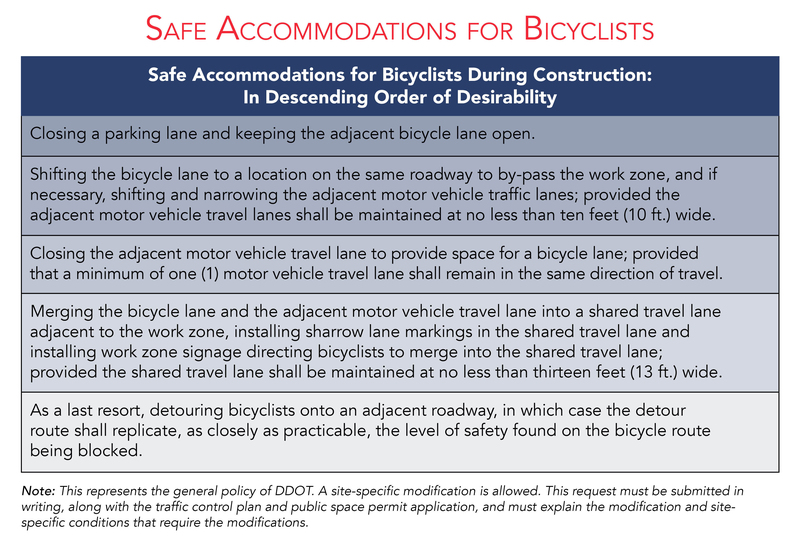 To safeguard transit users in the District – especially vulnerable users (bicyclists and pedestrians) – from these all-too-common construction zone hazards, the District Department of Transportation’s (DDOT) Public Space Regulations Division (PSRD) reviews, approves and monitors safe accommodations near work sites. Although these accommodations sometimes inconvenience pedestrians and bicyclists, they are put in place for the sole purpose of protecting transit users. One example of such a necessary inconvenience is a full sidewalk closure, which PSRD approves sparingly, most often when buildings are being razed. 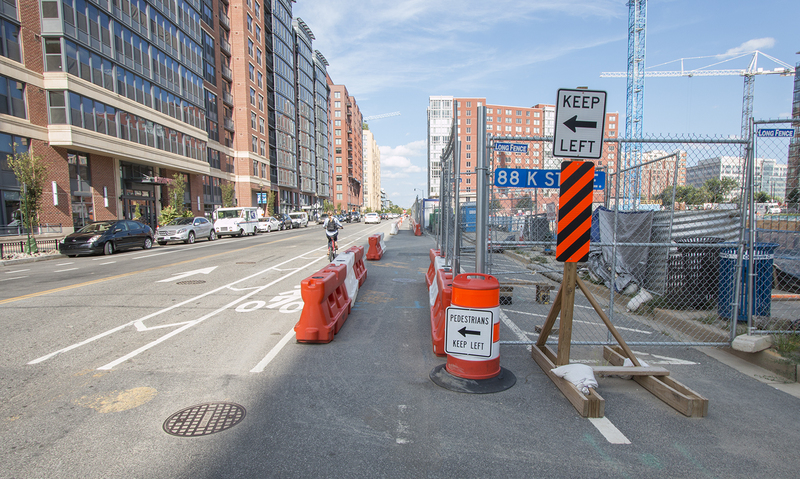 Closing walkways that abut a construction site is necessary during demolition; it’s less safe to be immediately adjacent to a building being razed, which is why DDOT allows for temporarily shutting down a sidewalk and directing pedestrians to sidewalks across the street, away from danger. 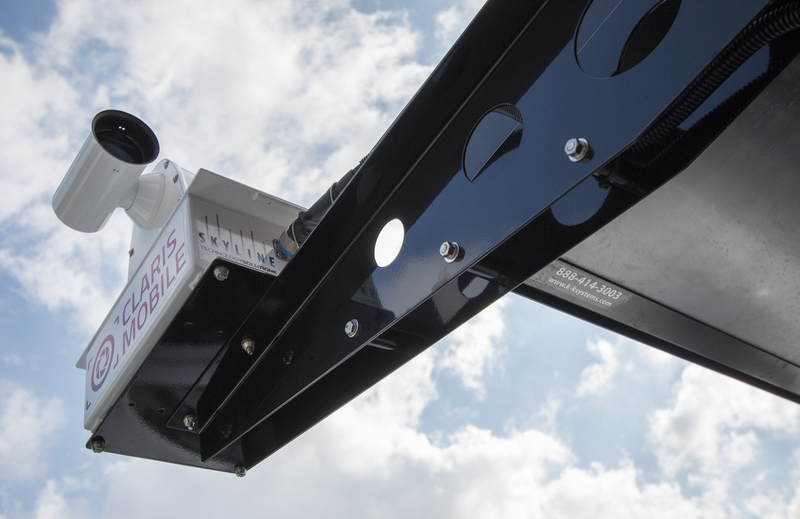 Although this might pose a burden to pedestrians, it’s a necessary safeguard to protect pedestrians from an extremely perilous construction process involving heavy, hazardous materials, which often leads to deaths, as shown in the aforementioned OSHA report. For more information on the District regulations that guide PSRD’s safe accommodations practices, please see District of Columbia Municipal Regulations (DCMR) Section 24-3315, which can be downloaded by clicking on “View Text” on the bottom of the DCMR page. DDOT school crossing guard Kiarra Hunt helps ferry a student across the intersection of 5th Street and M Street SE. It was closing in on the end of the school year and Kiarra Hunt was waiting for what had become a daily ritual: a high five from a passing Dad who was ushering his two small children to Van Ness Elementary School. The father was one in a long line of parents, guardians and children that Ms. Hunt, a DDOT school crossing guard (SCG), looked forward to greeting as she safely ferried them across 5th Street SE on their way to school. Ms. Hunt is one of the many new faces that DDOT has welcomed to the growing ranks of its SCG program. 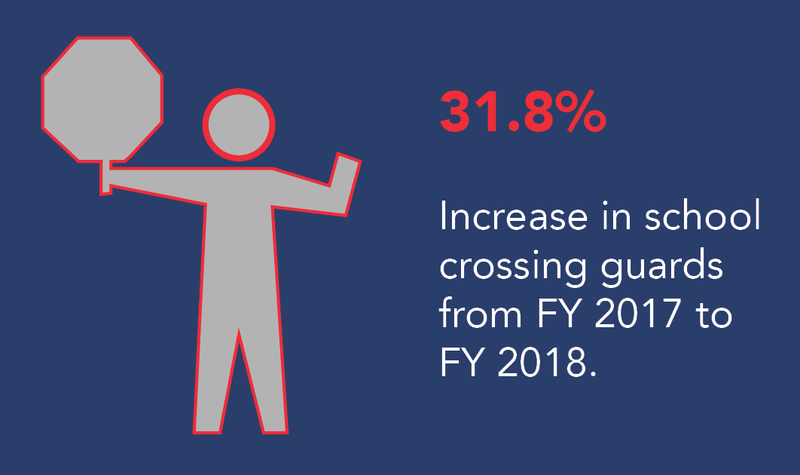 Since it began overseeing the District’s crossing guard program in 2007, the agency has steadily grown its SCG ranks to 265 staff members as of FY 2018, which is more than a 31 percent increase from the number of SCGs that were employed in FY 2017.
points are given to locations that would benefit more than one school. Distance to Other SCGs: More points are given for locations that are far from existing SCGs. Traffic Engineering Factors: This factor measures a number of other elements that affect the safety of a given crossing location. These elements include – but are not limited to – sight distance, the complexity of the intersection and the presence of turning vehicle conflicts. 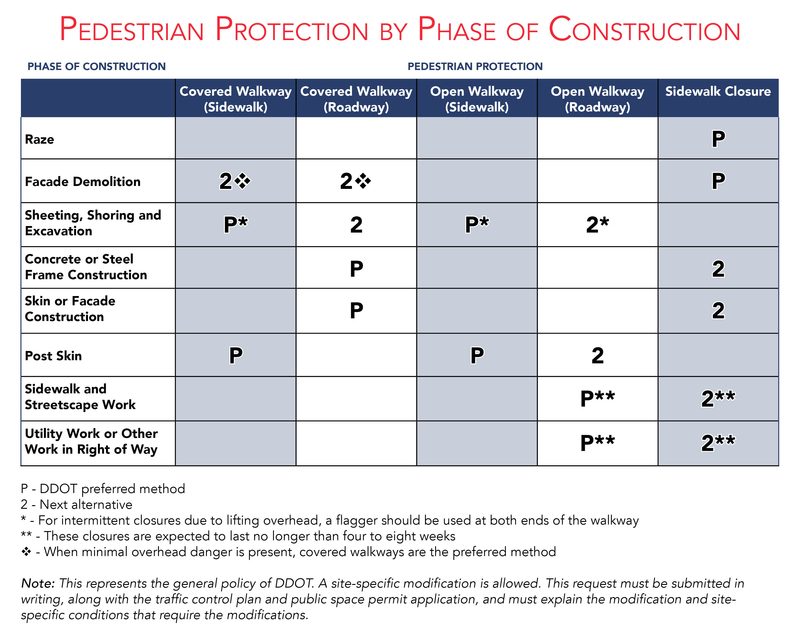 Pedestrian Volume: A minimum of 20 student pedestrians and/or bicyclists are required during a one-hour period for DDOT to consider posting a SCG. 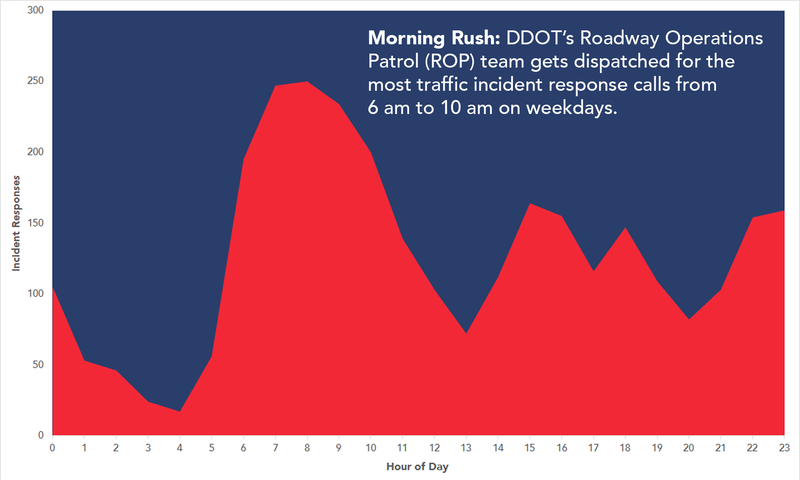 Reported Pedestrian Crash History: This factor takes into account the number of police reported pedestrian crashes that have occurred at the requested location during the last three years. SCGs are currently stationed at hundreds of public and charter elementary and middle schools around the District, and sometimes at multiple locations around a single school: from three SCGs stationed around LaSalle-Backus Education Campus off of Riggs Road NE to six SCGs around Deal Middle School. To view all of the schools where DDOT has stationed SCGs, please view our interactive map. 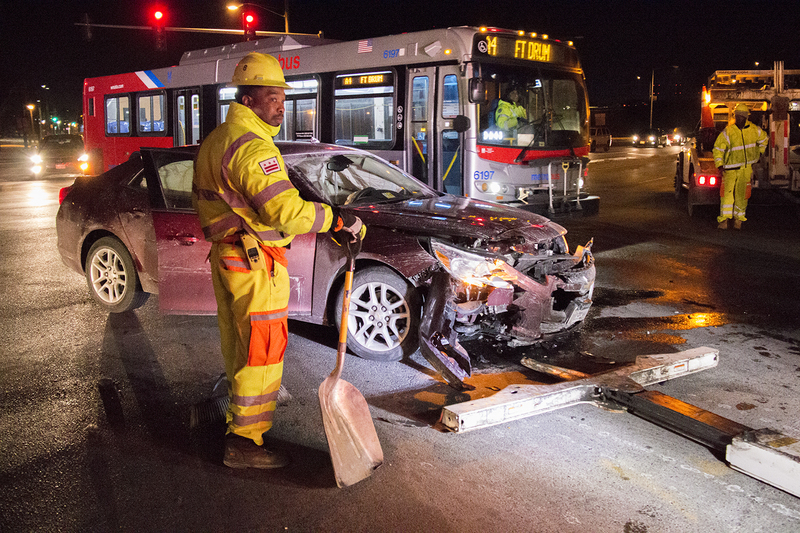 Until DDOT achieves Mayor Bowser’s Vision Zero goal of reaching zero fatalities and serious injuries to travelers, our SCG program has room to grow. With this in mind, we are currently fielding requests for new SCGs. To request a new SCG, please view our “School Crossing Guard Request Instructions” and fill out a “School Crossing Guard Request Form.” Please note that completed request forms must be submitted by the principal of the school that a new SCG is being requested for. Boost student physical activity, reduce parents’ fuel consumption and reduce pollution and traffic congestion near schools. 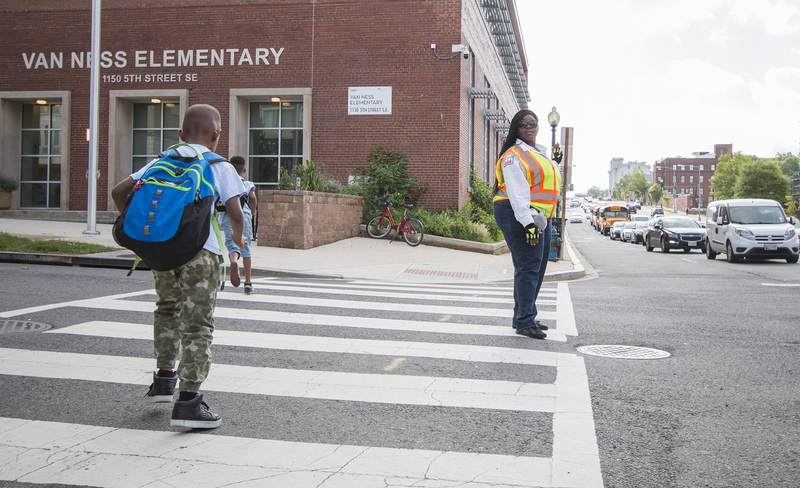 To help achieve those goals, DDOT offers Safe Routes to School planning assistance for DC Schools that are interested in improving safety for student walkers and cyclists. For more information about requesting a safety plan for a District school, please visit our Safe Routes to School Program webpage.